There's a little bakery here in Atlanta that sells pastries filled with blackberry or fig jam. They are simply exquisite little gems that are baked into a pillow like brioche and are sheer heaven that you can hold in your hand. 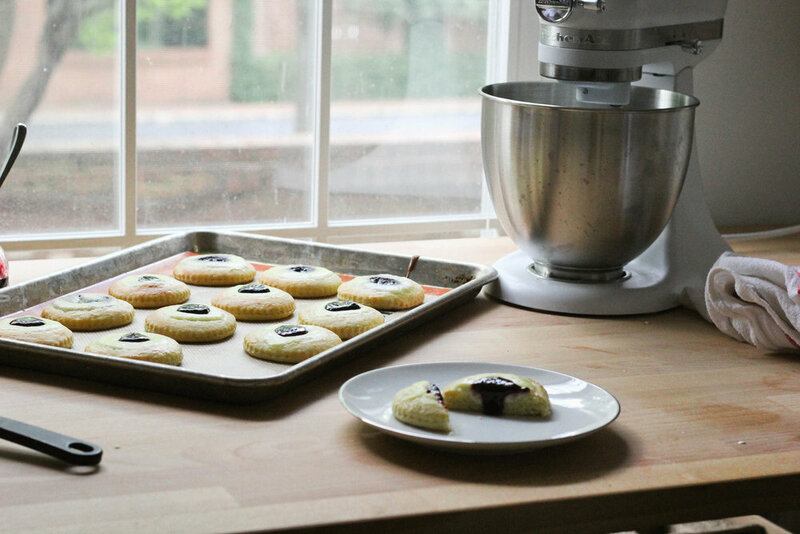 Over the weekend I went to work on recreating these treats at home using my KitchenAid® Artisan® Mini. My habit of spontaneous baking has increased ten folds now that I have my mixer well within reach, sitting right in the corner of my countertop. So this particular morning baking brioche and blackberries was on the agenda. Growing up there were wild blackberry bushes that grew not to far from our house. You'd have to dig deep into the brambles to find the glossy black ones that were ripe enough to pick. Your hands would bare the cuts and scraps of your labor and if you weren't careful you would have an unfortunate run in with a snake or two while wading through the bushes. I learned this the hard way. Luckily, this time, I was able to avoid the forging process and picked up some homemade blackberry jam right from a friend who has her own blackberries trailing along vines in her backyard. Using my KitchenAid® Artisan® Mini and the dough hook, I easily wiped up a batch of brioche for the base of these pastries. Mixing the dough with its high content of egg and butter gives it a rich and buttery crumb. Adding a ricotta custard base help to balance out the sweetness of the jam, making these pastries a delicious morning snack or even an after dinner dessert. Directions: For the brioche, mixer together the flour and yeast in the bowl of a stand mixer fitted with the dough hook and mix for about 10 seconds to distribute the yeast evenly. Mix in the sugar, salt and eggs on low speed for about 20 minutes. The dough will begin to stick to the sides. Use a spatula to scrap dough off the bottom and the sides of the bowl. Add in butter pieces a few at a time, making sure to incorporate after each addition. Scrape the bottom and sides of the bowl again and continue to mix the dough for more 10 minutes. Remove dough from the bowl onto a lightly floured surface. Knead the dough (it will be sticky so add a little flour to your hands) by stretching and folding the right side over the center, then the left side over the center. Repeat this process then place dough into a oiled bowl and allow to rest for an hour. Refrigerate the dough for at least an hour, or preferably overnight. Roll the dough out to about 1 inch thickness and cut circles using a 2in cutter. Place dough circle onto a baking sheet and allow to rise for about 1-1 ½. Meanwhile, in a separate bowl mix together the ricotta, lemon zest, sugar and egg to combine. Preheat oven to 350. When the dough has risen, brush the surface of each round with egg wash (one egg whisked together with 1 tablespoon of milk). Using your fingers gently push down in the center of each dough round creating a well. Spoon the ricotta mixture into the center then top with smaller amount of blackberry jam. Bake at 350 for about 15- 20 minutes or until pastries are golden brown. Remove from the oven and allow to cool slightly before serving.